When five-year-old Morenci, Mich., resident Abby Pierce complained that her bones hurt, her mother Susan chalked it up to growing pains. When the complaints continued, she took her daughter to the family doctor. It was 2011, and the doctor’s lab work suggested cancer. Two days later, at C.S. Mott’s Children’s Hospital at the University of Michigan, acute lymphoblastic leukemia, a cancer of the blood and bone marrow, was confirmed. So began Abby’s harrowing 2 1/2 year experience with a disease that made her feel sick but that youth wouldn’t allow her to understand. It was a long, difficult path back to health, her mother said, but Abby handled her illness with a grace beyond her years. “She always did whatever was asked of her. I’m extremely proud of her. She went through an awful lot,” Susan Pierce said. Now 11, Abby Pierce has been named the 2018 Honorary Junior Chair for the Fulton County Relay for Life event June 8 at the county fairgrounds. Wearing a special T-shirt, she will complete a lap around the Relay for Life track designated especially for cancer survivors. When she was first diagnosed, however, the medical staff at C.S. Mott’s didn’t waste time. The day after Abby arrived she was fitted with a port in her chest to deliver chemotherapy treatments. Over her two-week stay there the treatments continued. Then Susan Pierce and her husband, Bill, received good, then particularly surprising news: Abby’s cancer had gone into remission after the first day of treatment, but continued treatment for the next two years and three months was necessary to keep it away. During that time, the Pierces’ extended family scrubbed their house from top to bottom to keep germs at bay for Abby’s return. Friends and community members tended to the other Pierce children – Abby’s fraternal twin, Chelsea, and their older brother, Wes – in their parents’ absence. “We’re so fortunate to be from such a great community. They just stepped in,” Susan Pierce said. 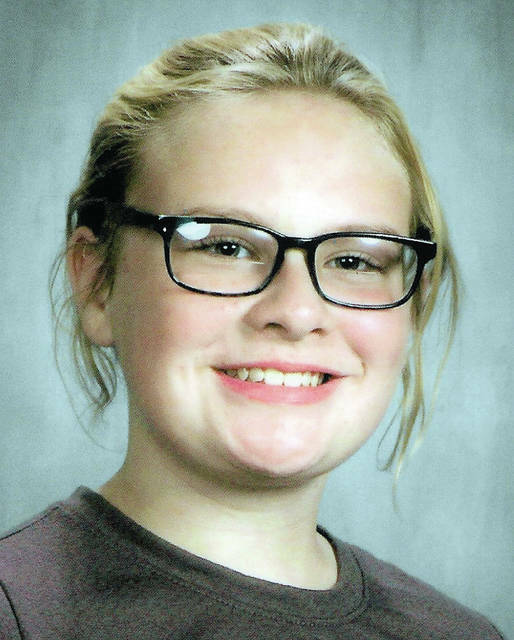 Almost daily for the next 2 1/2 years, Abby underwent chemotherapy, orally at home and once or twice weekly at the UM hospital, a 75-mile trip from Morenci. “We had a saying between us,” Susan Pierce said of Abby. “I said, ‘You can cry and scream as much as you want, but we have to do this.’ She looked at me and she knew I was doing everything I could for her, and she needed to do everything for me she could. She just stayed strong. Preschool was missed often during that period, and Christmas, Easter, and Abby’s birthday were spent in a hospital bed. She underwent 23 spinal taps to check for cancer in the fluid, and was admitted to the emergency room with high fevers over two dozen times. On a half-dozen other occasions she was admitted to C.S. Mott’s for at least a week. Through it all, her father, Bill Pierce, “always made sure we had whatever we needed,” Susan Pierce said. And, still, Abby fought, maintaining activities and trying to remain upbeat. She said because she was physically fragile family members babied her, making her feel even closer to them. The setbacks did extend Abby’s cancer treatments three months beyond their scheduled closing, but they finally ended on April 23, 2014. Four years later, she makes twice-yearly visits to the doctor, a preventative measure that will last until she’s 18. The chemotherapy treatments did have the residual effect of producing learning disabilities in Abby. But while that can become frustrating, she’s a solid A/B student.